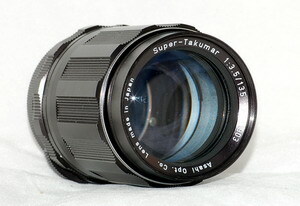 Very well built full metal construction lens, real competitor of Carl Zeiss Jena Sonnar 135mm f/3.5. Sharp even at wide open, very good performer in all area. Easy to catch right focus,very usable focal length. Can I say more ? No, just a perfect lens one of the best in short telephoto range. If you are lucky you can grab like new copy, quite common lens. I have the "K" generation of this lens. It is amazingly sharp, contrasty, and as all Pentax manual focus lenses up to the "A" generation, all metal and beautufully built. This lens appears as sharp as my 77 1.8 Limited lens. A great buy for $75.00 in mint condition.